A wedding photo booth rental in Surrey, BC is so much fun. You can literally harness the fun and excitement of it all and forever preserve the laughs, the memories, priceless moments, and hilarious antics of your special guests. While all weddings must come to an end, the amazing experience and delightful memories we capture will last for many years to come. They help people mingle, meet others, and have something fun to talk and laugh about. Turtles come out of their shells, and your shy guests who usually avoid the spot light will likely have a good time creating some hoopla as they monkey around in the photo booth. People really like to take home souvenirs of themselves. Photo booth pictures are the ultimate wedding favor you can buy. People put them on their refrigerator or on their office wall and literally keep them there for many years – creating a lasting connection to the memories of a fantastic day. Regardless of whether you rent a photo booth in Vancouver, New York City, Los Angeles, Toronto, London, Coquitlam, or Surrey, it can be said that a photo booth does what only the most talented photographers can do – but for a cheaper cost. We pack a whole lot into every rental as part of our standard package. When you rent or hire one of Forever Captured’s photobooths in Surrey for your wedding, you get unlimited photos with each individual photo session printing as either two 2×6 inch photo strips or one 4×6 inch print. You can choose a backdrop – even a green screen if you’d like – and we always bring along a ton of fun and interesting props for your guests to choose from and monkey around with in the photo booth. One of the things we’ve become well known for is our amazing photo strip designs. We create them in the vintage photo booth 2×6 inch format – but with a modern twist. They’re themed. The way we think, every part of a wedding should be themed – including the photo booth you hire. 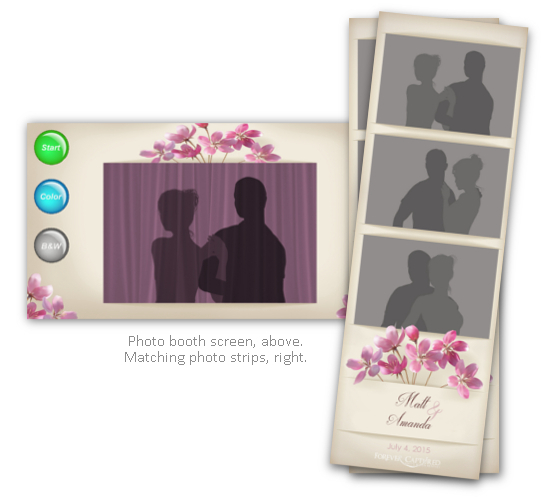 That’s why we regularly completely custom design photo strips for weddings from scratch for no additional cost. We design these in consultation with the bride and groom to infuse the overall look and feel of the wedding’s theme elements and colours into the photo strips. We even carry this themeing through to our booth’s touch screen that your guests will interact with. We theme it too so that it matches your custom photo strip (or 4×6 inch prints if you choose them instead). In the end, this all comes together as a beautifully customized theme that captures part of the magic of your special day and allows your guests to take this home with them as the ultimate wedding favor. The experience we create doesn’t stop there. We then display all your pictures in either a private or public online photo booth gallery (it’s your choice) where you and your newly minted spouse – along with your guests – can browse your guests’ photo strips, share them with friends, and even download them. But you don’t need to download them, because we provide you with a USB stick containing all your guests’ pictures so you can hold onto them for good and laugh and relive the memories whenever you choose. We use a premium, hi-tech, open concept booth – not one of those cheap DIY (Do-It-Yourself) ones you may have come across. Our booth has a really high resolution camera and a built-in touch screen to make things fun and easy for your guests. Even our prints are high quality. Our booth prints lab quality photo strips and postcard style prints within 10 seconds that are smudge proof and should literally last a hundred years – just like regular, quality photograph prints. We rent our portable booth for weddings in Surrey, BC and across the Lower Mainland and the Fraser Valley. We take care of everything for you: delivering it, setting it up, running it, and taking it away. You don’t have to do anything but smile for your pictures and have a great time. As far as the cost of our photo booth rental goes, we rent it by the hour and always include all the great features listed above. The price for our rental starts at $550 for 2 hours. We then charge $150 for each additional hour. Please contact us to see if we are available for your event. So if you’re searching for something that will bring your guests together and give them something to do and talk about that’s fun and exciting, a photobooth rental for your wedding in Surrey, BC is the best fit. Forever Captured Photo Booth Rentals is here to help you put together an exceptional experience that your guests will really enjoy and remember for years to come. Contact us today, and we can begin discussing what you have in mind for your special day. Contact us at info@forevercaptured.ca or at 778-899-5685.